I think I’ve peaked, you guys! Tonight, I made the best thing I’ve ever made in my kitchen, ever. I cannot express the excitement. 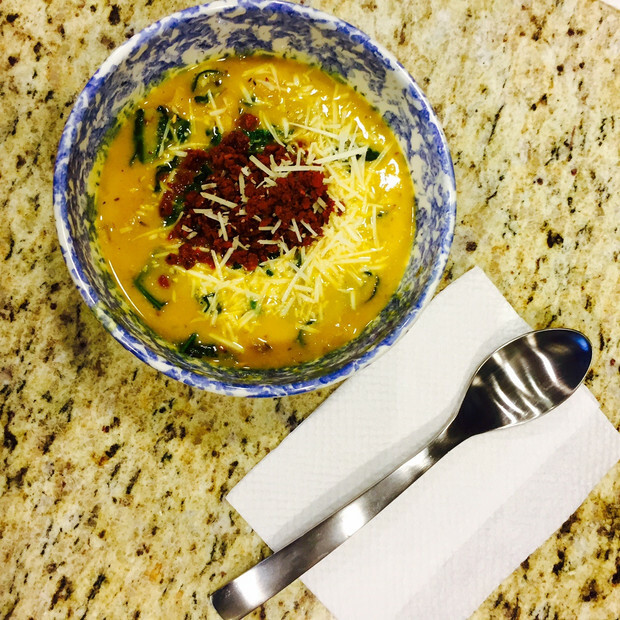 This was so aromatic, comforting, filling, mouthwatering, beautiful, easy, and healthy!!! I didn’t know all of these could exist cohesively, but they did. And the best part is… It’s VEGAN… Almost. Let’s get cooking, good looking! 1. Grab a large pot (I used my big pasta pot) and heat up the drizzle of olive oil. Throw in the chopped onion and crushed garlic. Reduce heat, the garlic likes to sparkle and sizzle. Stir and heat and get these all mixed and melty together. Don’t burn the garlic. 2. 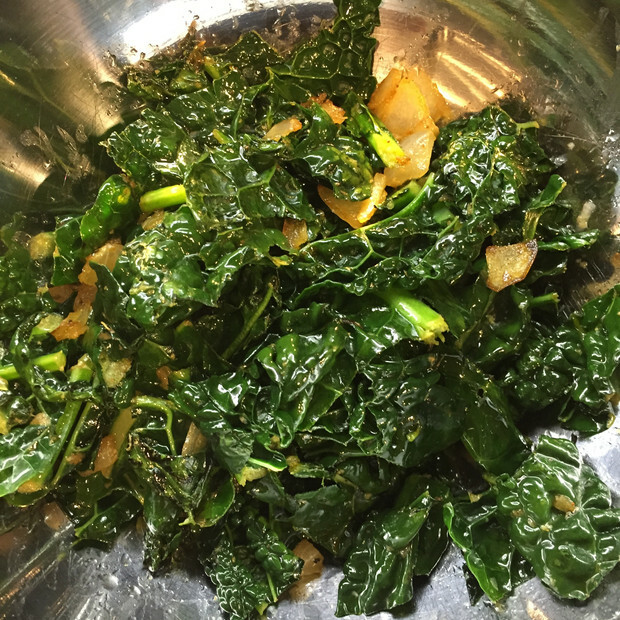 Same pot… Throw in the kale and stir around just to soften. The kale should stay a bright green and get a little glistening coat. Just a few minutes. Then pour everything into a bowl and set aside. 3. 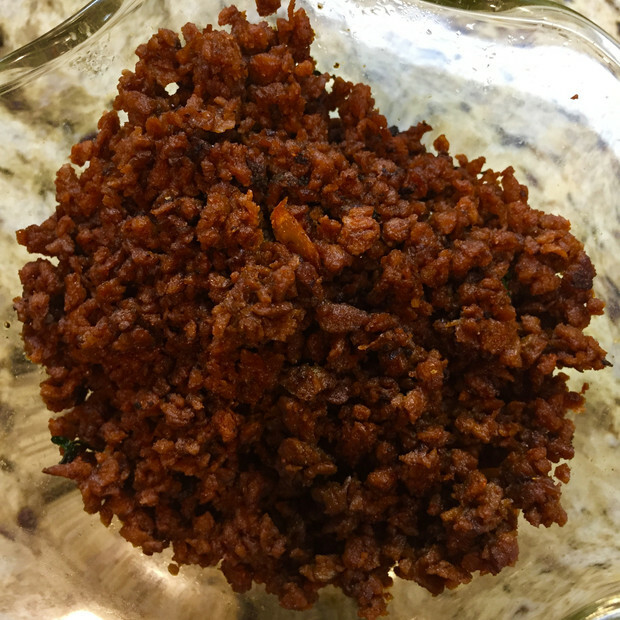 Same pot… Put in your spicy soyrizo. You don’t need to add any oil. Keep and eye on this and mix around so it breaks up and gets crumbly. Then pour this into a bowl and set aside. 4. 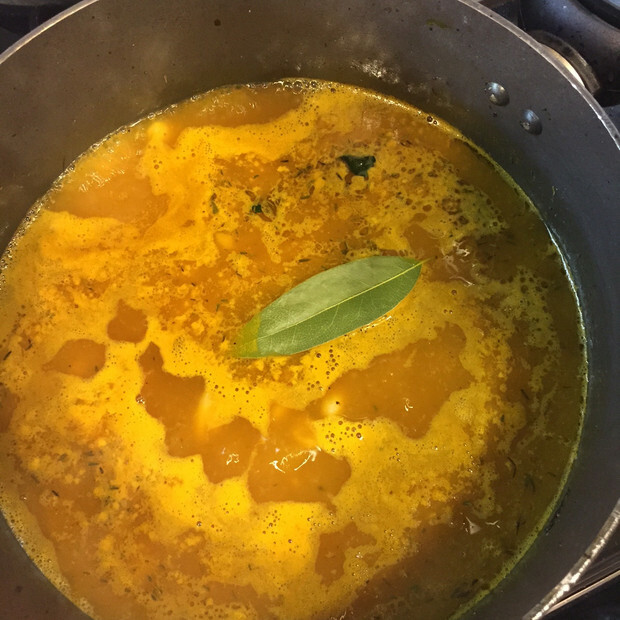 Same pot… Pour in the entire box of low sodium vegetable broth and get it to a boil. Then lower to a simmer. Add all seasonings except the bay leaf. 5. Drain your beans and rinse them well. You don’t want all that can goop getting in your soup. Add beans to the broth. Let this cook and get your beans soft. Takes about 10 mins. Stir frequently. 6. Add your dry bay leaf and stir around for just a few mins. Bay leafs are really strong so I would only leave it in for a little bit then toss it away. It can be overpowering. 7. Optional: grab your immersion blender and blend up about 1/3 of the beans. I like to keep most of the beans whole but blending some of them will make the soup nice and thick. 8. Optional: another secret tip for a thick soup is to add ONE whole wheat penne pasta noodle to the pot. The starch will nicely thicken up any watery soup. Plus, someone always gets the lucky noodle in their bowl. 9. Stir in a splash of the coconut creamer to make it extra creamy and restaurant-like. 10. Add the Kale back into the pot. Stir well and taste. It might need some seasoning but *note that the soyrizo is salty and spicy so don’t go overboard on the salt in the soup. 11. 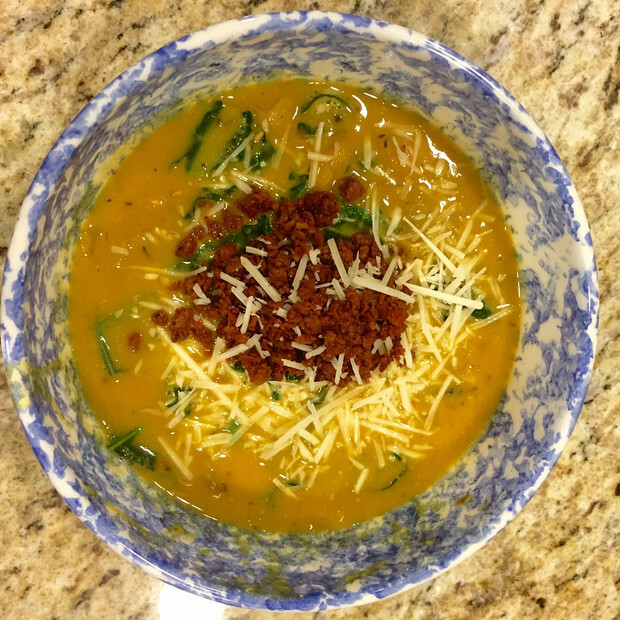 When you’re ready to plate, pour the soup in a pretty bowl. Top with some soyrizo and a sprinkle of Parmesan cheese*(leave this out if you want to keep it VEGAN) and take a picture before you devour it!! Isn’t she pretty?? From my bowl to yours, XO!